Sweet and salty flavors come together perfectly to make these uniquely delicious cupcakes. 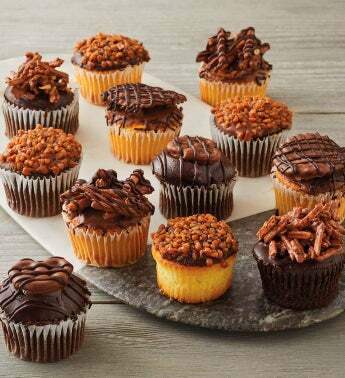 Twelve artisan yellow and chocolate cupcakes are hand dipped in either Belgian milk or dark chocolate and topped with toffee, milk chocolate-covered pretzel sticks, or a milk chocolate-covered potato chip. Caramel and milk or dark chocolate drizzle completes these decadent delights. Perfect for your next gathering or any occasion.